We met Bibi at the end of an afternoon of outreach. In Tanzania, very old women are called bibi, which means grandmother. We had visited about five different homes and were on our way home. On the way back we heard, from a distance, some happy voices and loud laughter coming from an ordinary-looking mud house on a little hill. As we passed under the windows the putrid smell of pombe (a fermented drink made from fruit and/or grain) filled our nostrils. We looked up to see toothless middle-aged and elderly women sitting around tables of the local bar; they were laughing and jesting together with men. They looked at us and we greeted them with “Mapembelo.” “Mapembelo va bene!” they merrily greeted us in return. What a sad sight. A few miles later, a lady stopped Baraza and exchanged some sentences with him. “She wants us to go and visit her old mother. Shall we go?” he asked. Why not? We turned to the left and entered a little poor-looking, but very clean courtyard. An old lady was sitting on the ground. She seemed to be in her eighties—but age is so difficult to evaluate in this country where hard work and grueling lives, poverty, and diseases have their heavy toll, especially on women. Baraza stooped down and greeted her, “Shikamo!”(a respectful greeting to the elderly) and she turned her face towards him. Her eyes were aged: a gray-white ring at the edge of the cornea told us she is over 60. Her eyeballs have sunk backward into their orbits. Her vision is no longer very sharp. “Ndio [yes],” says the daughter acquiescing. “Mother stopped drinking and does not even want to see a bottle of alcohol. This is amazing to us.” She picked up a few small stones from the ground and threw them at the chickens that feasted on corn drying on a little table in the corner. Bibi looked at Baraza and smiled. “Now I want to go with God. You have tried so much to tell me about Him and His love for me. I asked Him to be in my life and now He is my Father,” she said in a childlike way. A current of joy flowed through us. What a simple and beautiful testimony! We might give up on people, but God never does—praise Him! What an encouragement and an incentive to continue praying for our loved ones who are wandering far from God. The attention of the daughter returned to us. 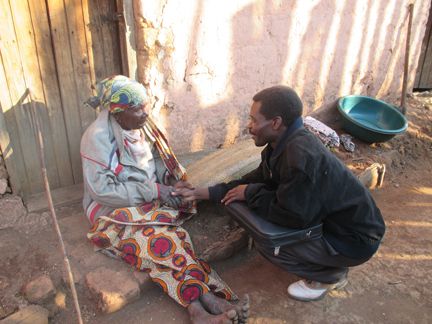 “Mother would like to go to church but she cannot walk anymore.” We then prayed with her and left. The following Sabbath, we decided to go and have a little time of church with Bibi. We had read a verse during the week and thought we would share it with her. It was a rainy day and Bibi was inside her little hut with another bibi and a younger woman. We were offered little benches to sit on and barely fit in the tiny room. In the corner was a fireplace—three stones and some pieces of wood. The room was dark but we can see with the light coming from the open door. This seemed to be the kitchen, the social place in homes here in Tanzania. Elisha attracted my attention to something moving, “It’s a rat.” But looking closer we saw about five guinea pigs. Knowing that in such a poor setting Tanzanians do not have pets, we conclude that this must be some kind of…food. Better chase that thought away. The floor was uneven and so sitting was difficult, but we all managed. Bibi was happy to see us and we exchange a few greetings. Bibi laughed loudly. “He is my Father, my Father…” she repeated. The discussion continued and led us to speak about life after death. We read Revelation 21:1-4. We talked about the New Earth that God is going to make for us. Bibi was thrilled. No more death, no more suffering, no more pain (she touches her poor limbs). “Bibi, you will be able to jump again like a calf in the prairie.” She chuckled and then asked, “But what will we eat there?” We tried to describe the different fruits and food that we have not yet experienced but often think about: the juicy mangos, the fresh pineapples, the creamy avocadoes, and so many other delicious things. “And what will we wear?” asked Bibi again. “We will have shiny white robes and a crown of gold.” Bibi touched her old kitenge that has seen better days—it is now all faded and worn out. She laughed and clasped her hands. Sitting on my left hand was the other old lady; she looked at Baraza, our translator, with eyes ready to devour each word coming out of his mouth, but was silent. Bibi asks again, “But who will we speak with? What will we be doing?” We told her about all the saved of the previous generations starting with Adam and Eve and Abel, until our time. “They will come and ask about our testimonies, about how you overcame pombe, Bibi; about how God led you out of this terrible sinful planet into His marvelous light. And there will be the angels. You will meet your guardian angel who accompanied you all the days of your life; and beings from all the other planets that Jesus Christ, God Himself, created.” “Ohoooooooooh!” sighed Bibi. “I wish I could die tonight to go there. Oh, how I wish I was there!” We explained to her that even if she died tonight, she would not go directly to heaven. “You will go there, Bibi. When Jesus comes back again, He will call out of the graves those who have died in Jesus, and the living ones will go to Him and they will all go to heaven together.” Bibi had been taught that when you die your soul goes to heaven or to hell depending on how you lived your life. “Mother will sleep well tonight,” said the daughter. The room was now so full that even a fly would not find enough space to move its wings. The daughter, another lady, and some children had joined us during the course of the discussion. The child on my right was sound asleep. For a little while everyone was silent. We were all enjoying a taste, in our thoughts, of what it will be like when we can see Jesus and live with Him. Some sighed. Bibi’s eyes were shining with joy. It was time for us to part again. After a closing song we prayed together. The rain had stopped and nature seemed to be cleansed from all the dirt of the week. The trees around were shining, dressed in a new deep green garment. Birds were singing. Our hearts, too… “When we all go to heaven, what a day of rejoicing that will be; when we all see Jesus, we’ll sing and shout the victory….” Amen. Even so, come, Lord Jesus. By Nadége Vande Voort of Eden Valley Foster Care Mission. harvester2188@gmail.com. Eden Valley Foster Care Mission, Box 17, Mafinga, Iringa, Tanzania.